Can Arsenal Really Win The Premier League? Arsenal mustered up a performance that will live long in the memory against Manchester United last weekend, winning 3-0 in style with a dominating performance, both offensively and defensively. But does this win make a statement that they truly are title contenders? It is widely known and regularly reported that Arsenal have not won the Premier League for 10 years, since that famous invincible season. What’s more though, is that they haven’t really competed for it in so long either, despite never finishing outside of the top four. However, on the back of 2 successive FA Cup victories, are Arsenal finally ready to mount a proper challenge for the biggest prize in domestic football? Arsenal are a “sleeping giant” according to Graeme Souness, who believes that Arsenal should be on the same level as Barcelona, Bayern Munich, Manchester United and Real Madrid, as one of the biggest forces in European football. I am sure that many fans would agree, and simultaneously love to see Arsenal reaching such heights, but before they compete for the Champions League, they must surely be able to compete for the Premier League. In the words of legend, Thierry Henry, Arsenal “must win it this year”, as the Frenchman doesn’t think they will have a better opportunity than they do now. Chelsea’s atrocious start to the season sees them lying around the bottom of the table with just two wins from eight. While Liverpool and Tottenham have the same struggles as usual, Manchester City look like the only team who will pose a real threat to our dreams, having seen off the only other real contenders, Manchester United, with relative ease at the weekend. However I am wiser than to completely write United off at this early stage. The form of the Premier League teams in Europe goes a long to show how poorly our home nation teams are playing this year, compared with the biggest in Europe. We play in the most competitive league, but it appears not the best. And with that, it shows how none of the teams in England have really taken the initiative in the league. Even Man City have struggled at times without captain Vincent Kompany, or other members of their spine, resulting in us sticking fairly close to them for now. No doubt they will be favourites for the league, though. Yet it is this struggling from which all teams are currently suffering that makes this our best opportunity to win. As Thierry said, “They must win the Premier League this season”, because you know that next year, these other teams will expend a huge amount of resources in order to comeback. Something Arsenal won’t do in the same way. We can all agree that Arsenal have the basis for a great team, but time and time again they have fallen just short. They have been a nearly-team, a near miss. For years now, pundits and fans alike have cited certain positions in need of improvement. Today though we are finally starting to see things lining up. Theo Walcott and Francis Coquelin appear to have come to our saviour in those pivotal central roles, however a lack of cover for them could prove a big problem should injury strike. With so many games to be played, rotation will be key to our success. We remain in every competition, for now, but face a huge uphill battle to stay in the Champions League as we reside bottom of the group after embarrassing defeats to Dinamo Zagreb and Olympiacos, with two games against Bayern Munich to come next. Yet could our failures in the Champions League, work out positively? We saw Liverpool come close to winning the League two season ago, when they did not have to play in Europe at all. Similarly Arsenal finish the season strong regularly, once they have been knocked out of the Champions League, in the Round of 16. Perhaps exiting the Champions League at the group stage for once, would allow the team to push on for the Premier League, without having to worry about resting players, rotation, or fatigue, as much as normal. While this would be a positive out of a shambolic Champions League campaign, I do not condone us going out with ease, and I believe we should push for the maximum points we can to try and qualify for the next round, because this is the Champions League we are talking about after all. To win in a big game is always a statement, we are in it, we are two points off the leaders. I hope the result today will give us belief, and ambition to fight for it. To take an impartial outlook on the situation, I believe Arsenal can win the League, but Manchester City have to be considered favourites for it. They have the experience and mentality for it, whereas thus far this season Arsenal have lacked the consistency needed. They would need Man City to show similar inconsistencies. Arsenal’s chances of winning it would be greatly improved were they to be knocked out of the Champions League, but that is not something I want nor hope to see; especially with this coefficient problem, and all the English teams looking fragile at best. Plus those Champions League nights at the Emirates against some of the world’s greatest are some of the best nights of the year. The final variable will come down to Arsenal’s biggest enemy. Injuries. Keeping the likes of Sanchez, Ozil, Coquelin, Walcott, Cech, fit. We will need our star players to play and deliver week in week out. Theo Walcott has yet to put pen to paper on a new contract at the Emirates, but still has two years left on his current deal after he signed on for three and a half years, eighteen months ago, a saga that was also overly drawn out. However the 26-year-old is hopeful of staying at a ‘special’ club and is looking forward to what could prove to be a big year for the team, he believes. “My agent has talked to the club. “I enjoy playing for this club, so I am just letting them crack on with things and I’ll continue playing football. Asked whether he would be happy if the talks carried on past the start of the upcoming campaign, he added: “Definitely. It’s not in my thought process at all. “You don’t want to dwell on it, you want to play well and, if it happens, it happens. “I won’t let that delay the way I’m going to be playing this season. I can’t let that affect me, I want to do well for this club. “It’s my first pre-season for two years now, so I want to work hard and get fit. 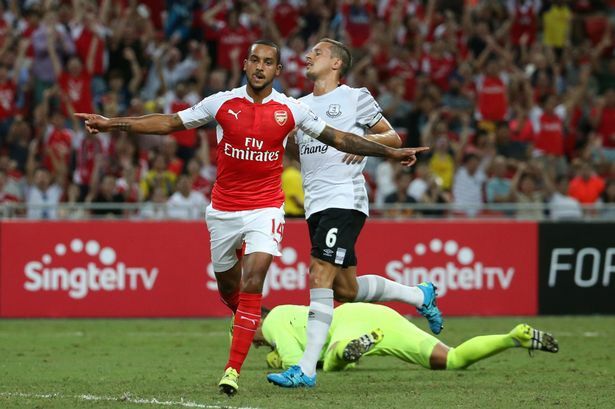 Arsenal are reported to be in the market for a striker, despite a strong end to the season from Theo who continued his goalscoring form at the weekend, scoring the opener in a 3-1 win over Everton to win the Barclays Asia Trophy. The strikers names most recently being mentioned are those of Karim Benzema and Pierre-Emerick Aubameyang, having already missed out on some targets there is not a wealth of proven talent left to select from. So is it vital that Arsenal sign a striker in order to compete for the major trophies? Alexis Sanchez is set to miss the start of Arsenal’s season, having been given an extended holiday following his Copa America triumph on Saturday evening. Sanchez played a further 6 games for his country since the end of Arsenal’s season, leading them to a first Copa America title in 99 years, where he scored the winning penalty against Argentina to ruin Messi’s chance of winning a major tournament with his country. This run of games for Alexis follows what had already proved a physically challenging first year in England for the Chilean, where the game is more intense, and he barely missed a kick in a season where there are no Christmas breaks. Having said that, Sanchez lives to play football every week, and he certainly didn’t look too tired when he sprinted three-quarters of the pitch in the 105th minute against Argentina in the final, only to just miss out on finding the net in what ended up as 120 minute bore-draw. But Arsene Wenger is renowned for looking after his players, and as Mesut Ozil and Per Mertesacker were given additional time off following their World Cup heroics last summer, Alexis is set to receive the same treatment this time round from the manager. The 26-year-old is reportedly due to return to training on the 27th July, giving him less than a week back with the other players before they take on Chelsea in the Community Shield; and just under two weeks before the Premier League season kicks off. The rest of the Arsenal squad who were not involved in the tournament, returned to training yesterday, as they look to prepare for what will hopefully be a season full of promise, and finally a real title challenge. What would the Czech Republic and Chelsea goalkeeper bring to Arsenal? 1. First and foremost, Petr Cech is an experienced and proven goalkeeper. He has won multiple Premier League’s and a Champions League, and therefore will come with a winning mentality. A trait the Arsenal players are starting to learn themselves after back-to-back FA Cup victories. 2. Secondly, Cech will provide Arsenal with some stability in goal. A position that has been filled by players that weren’t quite good enough, mistake prone, or just down right incompetent, since the depature of Jens Lehman all too long ago now. Funnily enough, it is David Ospina who is probably the best goalkeeper Arsenal have had since those days, but now looks likely to leave with Petr Cech’s arrival, who is still nonetheless, an upgrade. 3. Arsene Wenger claimed it was Ospina who is the best goalkeeper in the league, statistically. But he was wrong. Petr Cech may have only played 7 games in the league this season, but he did have a statistically better save percentage than Ospina. 88% compared to just 80%. Meanwhile Szczesny’s 60% is not even worth a look in. Then clean sheets and mistakes made, also epitomise Cech’s level of professionalism and that is a general word-class talent. He is the best of three. The stats don’t lie, do they Arsene. 4. Petr Cech will also bring with him, his leadership. He will command the back four as any good keeper should, but this is something we haven’t seen at Arsenal for all too long. It is this traditional sense of a goalkeeper commanding his box, his area, that we haven’t seen. Making any loose balls his. Making the defenders sure of where their man is, and where they should be. The keeper sees the whole game, and this communication and leadership is key to not conceding. 5. Finally, Arsenal now have a vacancy in the form of a goalkeeping coach position, after previous coach, Tony Roberts, left to join Swansea last week. Chelsea coach, Christpohe Lollichon, followed Cech to Chelsea from Rennes in 2007. It looks likely this could be something else Cech brings with him. Is this all a coincidence? I think not. Lollichon believes Cech has “3 or 4 excellent seasons” left in him. And what better way to prolong your career at the top, than to bring the coach who knows you better than anyone with you? Sky Sports believe he has already agreed terms with Arsenal, and Chelsea star believes he is worth 15 points a season. Thierry Henry believes Alexis Sanchez is the man who can make the difference and win Arsenal the Premier League again for the first time since that famous invincible season, now 11 years ago. 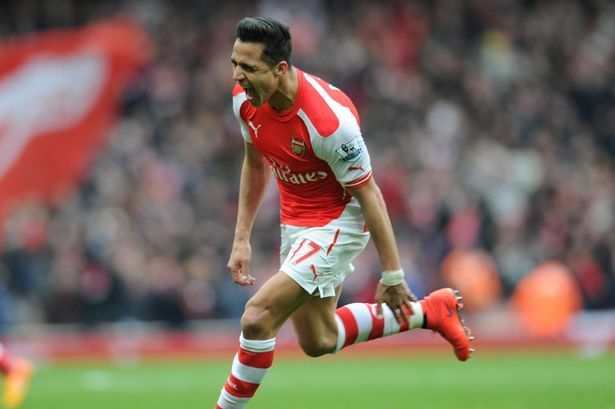 Arsenal legend turned Sky pundit, Henry, believes Sanchez is a ‘match-winner’, but still has room to improve. “If you’re an Arsenal fan, we were all waiting for that type of match-winner,” Henry told Arsenal.com. “Look at what he did in the FA Cup final and what he has been doing since his arrival. He has been more than tremendous. Sanchez has had a very successful first season at Arsenal; scoring 25 goals in his first year is an incredible fate, and hopefully he will push on to even better things next season. However, if Arsenal are to win the Premier League, they need some more players to come in and help Sanchez, according to Thierry. “He is the guy who can change the course of a game. I love the way he plays, he plays with his heart and I know the fans love that about him.